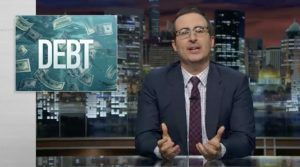 The 20-minute “Debt Buying” segment originated June 5, 2016, on Last Week Tonight with John Oliver. NEW YORK — A June 5 segment of the HBO hit comedy series, Last Week Tonight with John Oliver, featured the RIP Medical Debt charity forgiving nearly $15 million worth of donated medical debt for around 9,000 people — a new giveaway record for American television. John Oliver brought attention to debt industry abuses and the specific issue of unpaid medical debt. John Oliver reported that American households collectively owe more than $12 trillion in debt, with $436 billion at least 90 days overdue. He presented LWT’s investigation of the debt buying industry, airing video from a hidden camera at a professional conference. A debt buyer on the platform observed how debtors are ignorant of their rights as consumers. Oliver set out to show how “disturbingly easy” it is to start a company that can purchase debt cheaply and collect it aggressively, including debt no longer due under law. LWT registered a debt-buying company in Mississippi for $50, naming John Oliver as the Chairman of the Board, calling the company Central Asset Recovery Professionals, Inc. — CARP, the bottom-feeding fish. CARP located and purchased from Texas for about $60,000 a medical debt portfolio worth $14,922,261.76 — paying less than a half-cent on the dollar. Oliver said the portfolio held the names, current addresses and Social Security numbers for about 9.000 accounts. CARP could legally send collection agents to hound these people. Oliver and LWT instead donated that $14.9 million portfolio to the debt-forgiving charity, RIP Medical Debt. In the finale, John Oliver stood before a wildly cheering live studio audience with millions watching on TV and online. Amid a triumphant fanfare he grandly pushed a giant red button. Dazzling lights flashed as paper bills fluttered down like confetti. John Oliver through RIP instantly abolished nearly $15 million in unpaid medical debt. Gone. For good. John Oliver’s giveaway surpassed Oprah Winfrey’s 2004 TV record of giving almost $8 million worth of GM cars to everybody in her audience, creating the iconic “You get a car!” meme. RIP’s forgiveness of LWT’s “$15 million” worth of medical debt set a new record for television. “It’s strange to describe the apparent purchase and forgiveness of nearly $15 million in medical debt as “impish,” but bear with me. John Oliver Buys $15 Million In Medical Debt, Then Forgives It on TV. RIP Medical Debt locates, buys and forgives medical debt on behalf of individual donors, philanthropists and organizations who step up to provide financial relief for individuals and families burdened by unpaid and unpayable medical bills. Two former collections industry executives, Craig Antico and Jerry Ashton, incorporated RIP on July 25, 2014, as Medical Debt Resolution, Inc., a New York-based not-for-profit doing business as RIP Medical Debt, recognized by the IRS as a 501(c)(3) charity.